The Jones Act, long seen as a challenge for the US offshore wind industry, could potentially be an opportunity for the sector, experts have said. 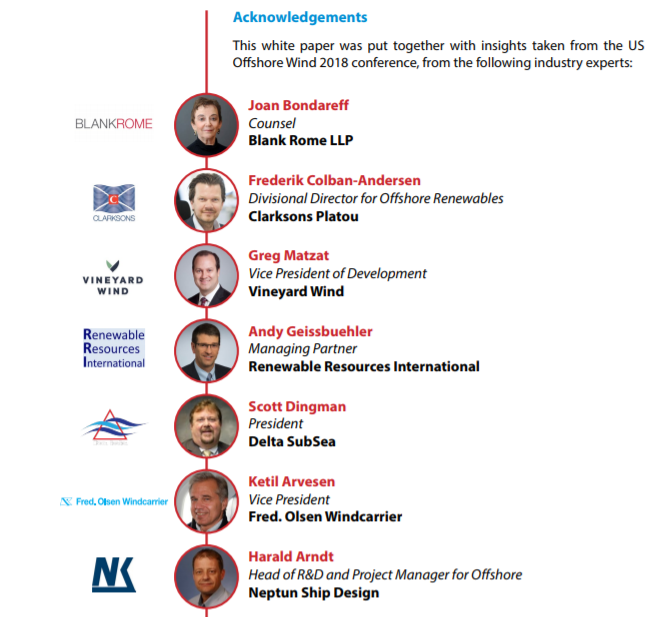 “I like to look at the Jones Act as an incentive for shipyards, not an impediment,” said Joan Bondareff, chair of the Virginia Offshore Wind Development Authority, of counsel at Blank Rome LLP and one of several specialists to address the audience at the US Offshore Wind 2018. “It’s been around for 100 years and it’s a law we’re going to have to live with,” she said. Frederik Colban-Andersen, divisional director for offshore renewables at the integrated shipping services provider Clarksons Platou, said dealing with the Jones Act might force the US offshore wind industry to come up with innovative installation strategies. It is still unclear exactly how the US offshore wind industry will deal with the Jones Act, however. The Act, a federal law dating back to 1920, requires goods shipped between US ports to be transported on ships that are built in the US, mostly owned by US entities and operated by US citizens or permanent residents. This means vessels created for the offshore wind industry in Europe could not operate on US wind farms unless they do so from European bases, or receive components and crew delivered by Jones Act compliant feeder vessels. However, creating new offshore installation vessels just for the US market is also likely to be costly, as it would likely be limited to the home market and not competitive for global application. “Foreign investors are looking at US companies for joint ventures to comply with the Jones Act for installation work,” Joan Bondareff added. The Jones Act is not the only issue facing offshore wind operations in the US. “Ports are just as much of a challenge as the vessels,” said Greg Matzat Vice President of Development at Vineyard Wind. 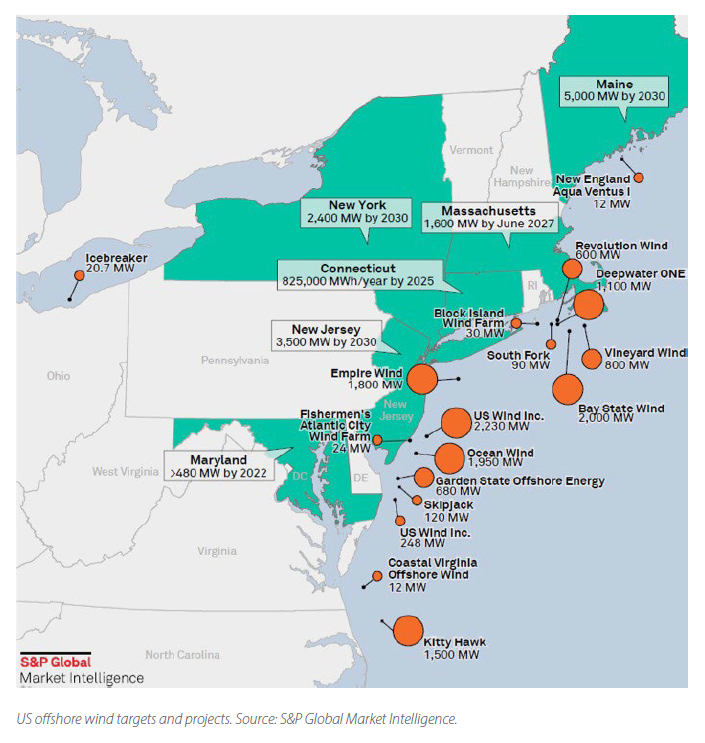 While there is still little clarity on how the US offshore wind industry will ultimately overcome Jones Act and port-related challenges, most experts do not foresee a major problem in servicing the 1.7 GW of capacity slated for imminent installation. Scott Dingman, president of Delta SubSea, a provider of inspection maintenance and repair and light construction services, said that of 60 or so vessels that might be needed for upcoming wind farm installations, 55 are in the market today. And Geissbuehler said one blessing of the Jones Act was that it wouldn’t add to the uncertainty of US offshore wind. “At least we know what we’re dealing with,” he said.